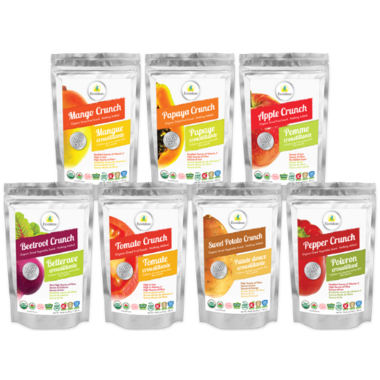 Ecoideas Fruit and Veggie Crunches are dehydrated using a unique ‘VitaSnack’ dehydration process that preserves the nutrients and intense fresh flavour. All of the fruits and vegetables are grown organically, seasonally selected, and simply sliced. They are first lightly dried below 47 C, keeping them raw. They then enter the texturizing phase, where extra-dry air gives them a porous texture, driving out moisture without having to raise the temperature. This phase gives Ecoideas Fruit and Veggie Crunches their 3 unique properties: maximum nutrition, intense flavour, and irresistible crunch! Rich in soluble fibre and a source of natural antioxidants. Low in saturated fats to help maintain normal blood cholesterol levels. Low in sodium to help maintain normal blood pressure. High Vitamin C content contributes to normal functioning of the nervous and immune system, blood vessels, skin, cartilage, gums, bones, teeth. Helps to regenerate the reduced form of Vitamin E.
These taste really good - love it in soup but beware they smell terrible. These are a favorite for my kids. Just wish they weren't so expensive! 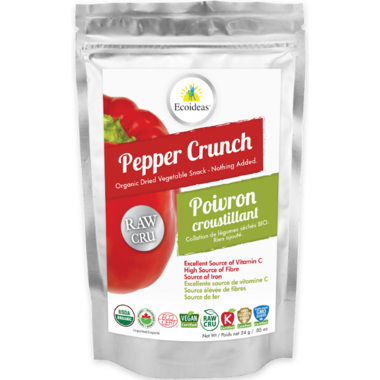 Light, crunchy, and great roasted pepper flavour! They reminded me of the red pepper flakes spice. I really enjoyed them. I just wish either they were cheaper for the small quantity, or more came in the package for the same price. I understand that this is a super healthy and natural product, but it's also super pricey, and that's the only reason for the less than 5 star rating. However, great flavour and texture with no additives make these an awesome alternative to chips! Really enjoyed these peppers taste like oven roasted, yet they are raw and organic. Would recommend these. Good as a snack or added to your salad.